Easily produce images and text which jump off the page with the HP Color LaserJet CP3525n Printer. High performance and reliability make the HP CC469A#ABA ideal for general and specialty print projects. Create impressive marketing materials with vibrant color, effectively communicate internally and generate sales for less time and money than the cost of outsourcing. This network printer also outputs consistent, crisp text at speeds up to 30 pages per minute. Instant-on Technology uses cutting-edge fuser technology that enables print jobs to begin quickly from low power mode. The Time To Completion (TTC) of a typical office print job can be nearly 3.5 times faster from low power mode on this device with Instant-on Technology than on devices without it. 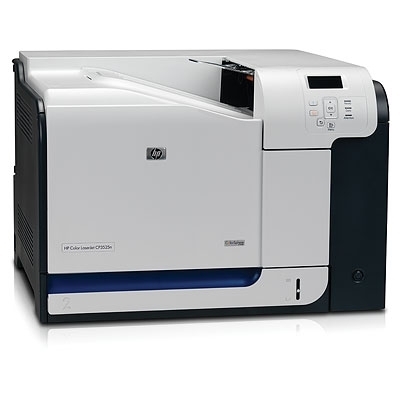 The HP CC469A#ABA Color LaserJet CP3525n Printer is also able to grow as your business grows with expandable memory, an open EIO slot, and optional third party solutions.